Do you wish you had a long-term plan for the advancement of your procurement career? Well, that’s exactly what the SPSM® Family of Certifications provides! With four levels based on the Strategic Procurement & Supply Management Body of Knowledge® (SPSM-BOK®), the SPSM® Family of Certifications allows you to choose how far you want to go. Looking for a procurement certification program to help give you that extra edge in competing for great jobs while having a qualification to be proud of? Earn the first level in the Family – the SPSM® Certification. Want to prove that you’re among the elite procurement professionals in the world? Move onto higher levels, such as the SPSM2®, the SPSM3TM or the soon-to-be-available SPSM4TM Certification! Learn more about these procurement certification programs below. This first certification program is Level 1 and covers the “Essential Procurement Skills” of the SPSM-BOK®. The path to SPSM® Certification involves completing the six Level 1 online procurement courses, passing the SPSM® Exam, and submitting an application. You must earn the SPSM® Certification before you are eligible to earn the higher level certifications (SPSM2®, SPSM3TM, etc.). 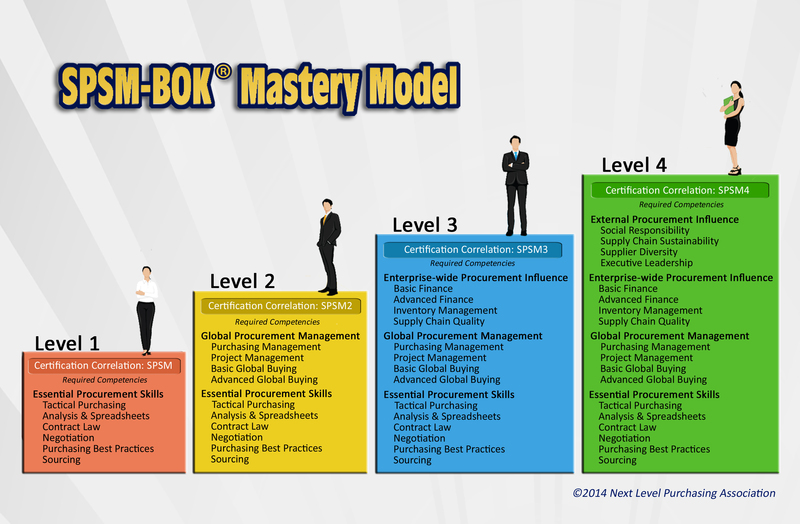 The second certification program is Level 2 and covers the “Global Procurement Management” competencies of the SPSM-BOK®. The path to SPSM2® Certification involves first earning the SPSM® Certification, then completing the four Level 2 online procurement courses, passing the SPSM2® Exam, and submitting an application. The third certification program is Level 3 and covers the “Enterprise-Wide Procurement Influence” competencies of the SPSM-BOK®. The path to SPSM3TM Certification involves first earning the SPSM® and SPSM2® Certifications, then completing the four Level 3 online procurement courses, passing the SPSM3TM Exam, and submitting an application. The fourth certification program is Level 4 and covers the “External Procurement Influence” competencies of the SPSM-BOK®. The SPSM4TM Certification is anticipated to be available in end of 2018. Candidates interested in getting a head start on earning this certification are welcome to enroll in and enjoy the currently available online procurement courses from this level – Exemplary Supply Chain Social Responsibility and Strategic Supplier Diversity Best Practices.